Built in 1903 as The Caledonian Hotel, the Waldorf Astoria Edinburgh - The Caledonian has been the epitome of Scottish hospitality for over a century. The building takes its name from the Caledonian Railway Company, who used to own the hotel for many years. Originally operating as an accommodation for weary travelers disembarking from the Caledonian Railway, the hotel rapidly emerged as one of the premier destinations in all of Edinburgh. Known affectionately throughout the city as “the Caley,” the building quickly built a reputation for its exhilarating galas and sumptuous banquets. By the mid-20th century, the popularity of The Caledonian had grown to such an extent that it was routinely attracting numerous, high-profile celebrities from around the world. Stan Oliver, Judy Garland, and Gene Kelly were just a few of the distinguished people to frequent the building during the latter part of its history. In 2000, Hilton Hotels acquired this exquisite building, relaunching it as the Waldorf Astoria Edinburgh - The Caledonian in 2016. Today, The Caledonian continues to maintain its reputation as an internationally respected luxury hotel and has recently been listed as a Category A historic building by Historic Environment Scotland. 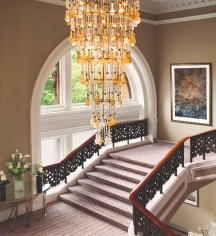 The Waldorf Astoria Edinburgh - The Caledonian’s 241 rooms and suites feature the finest fabrics, fittings, and furniture. With extensive views over the city, including some with spectacular views of Edinburgh castle, each air-conditioned guestroom offers WiFi connectivity, a flat-screen television, and exclusive Salvatore-Ferragamo bath products. Guests will discover delicious French cuisine at The Caledonian’s two award-winning restaurants: The Pompadour by Galvin and the Galvin Brasserie de Luxe. Few chefs have done as much to revitalize the traditions of classical French cooking than Chris and Jeff Galvin, who together supervise each restaurant. Guests can also receive a luxurious, full-body massage at The Caledonian’s prestigious Guerlain Spa and Health Club, the only one if its kind in all the United Kingdom. With a total of ten marvelous meeting spaces from which to choose, The Caledonian is also perfectly suited for every occasion. Guests can host anything from small cocktail receptions to grand, picturesque weddings. 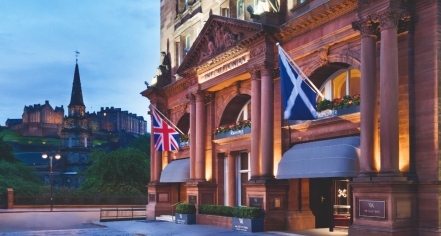 Situated in Edinburgh's West End, the Waldorf Astoria Edinburgh - The Caledonian is enclosed in a ring of cultural landmarks that define Scottish heritage. Close to the hotel resides Edinburgh Castle, the most popular historical site in the entire country. Constructed on an extinct volcano during the 12th century, Edinburgh Castle was Scotland's principal royal palace during the Middle Ages. Settled around the fortress are city’s two historic neighborhoods: Old Town and New Town. Old Town, of which the West End is a part, is a tantalizing maze of medieval buildings, while the New Town is filled with beautiful, Georgian-era architecture. Both districts constitute the city’s celebrated UNESCO World Heritage Site. Guests residing at the Waldorf Astoria Edinburgh - The Caledonian can admire the city's unique past as they stroll through the charming streets within these nearby neighborhoods. Guest can also travel east of the hotel to either Arthurs Seat or Calton Hill for unrivalled views of the region. More well-known destinations are just a short walk away from the hotel as well, including the Royal Mile, the Palace of Holyrood House, and Mary King's Close. Staying at The Caledonian will situate guests perfectly to explore both the city as well as the surrounding countryside. Waldorf Astoria Edinburgh - The Caledonian, a member of Historic Hotels Worldwide since 2018, dates back to 1903. The hotel was once the preferred train station of the British monarchy, and the historic clock inside the lounge still runs five minutes fast, just as it has since the early 1900s. Deposit: Valid credit card required as guarantee for the reservation. Early Check-In/Late Check-Out: Early Check-in subject to availability. Late Check-out £30 per hour, subject to availability. Extra Person Fees: £50 per night. Hotel/Resort Fees & Taxes: None. Parking: On-site parking is available for £25 for 24 hours. Rollaways: Complimentary for children and £50 for an adult. Built in 1903 as The Caledonian Hotel, the Waldorf Astoria Edinburgh - The Caledonian has been the epitome of Scottish hospitality for over a century. The building takes its name from the Caledonian Railway Company, who used to own the hotel for many years. Learn more about the History of Waldorf Astoria Edinburgh - The Caledonian .